As well as that those closest to you compromise themselves in the short term by getting into a state of flux in order to create said alchemy for themselves. This applied especially to Ferrari, though perhaps its flux was of the more time-honoured sort. "That's a lesson of their own history that they don't even seem to be aware of. They could do a lot worse than look back and say 'why did that work? 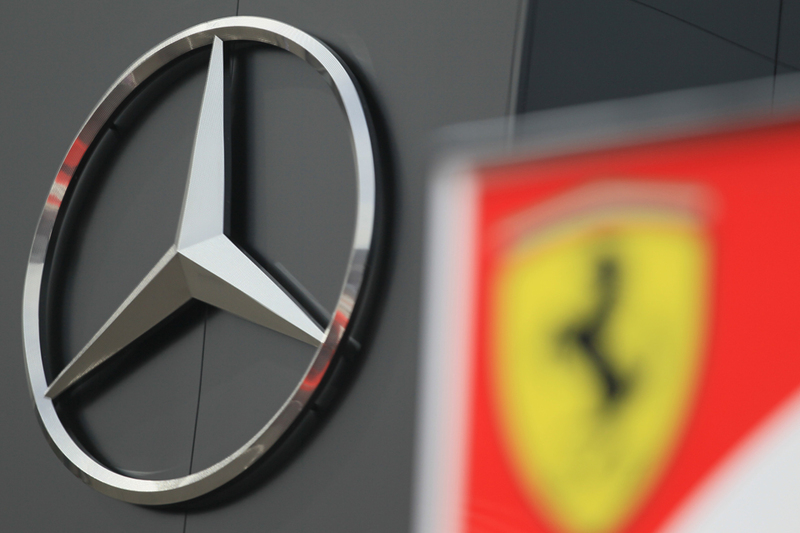 Why did that Ross Brawn, Jean Todt, Michael Schumacher era work so effectively?'" So said Mark Hughes at the season's end of the Scuderia. From the outside the lessons are glaring - take the mid 1970s or indeed the early 2000s dominance Hughes mentioned and the team was for once protected from its notorious politics. The squad, allowed to get on with it and use its considerable resource and passion, got devastating results. But so easily the grand Italian concern slips back to old ways, and this year it happened again. The team was run from the boardroom, and aggressively so. If Ferrari president Sergio Marchionne's abrasiveness helped the team on the way up in 2015, it was a hindrance in 2016. We started the campaign thinking Ferrari would give the Mercs plenty to think about, and indeed it led and probably should have won in Australia's season-opener. But it was on the flight back, arguably, that things began to unravel, as tragic news emerged that the wife of its highly-rated technical head James Allison had passed away suddenly. Unable now to give full time commitment - adding to that they'd been disagreeing on longer-term direction - Marchionne chased Allison out of the door mid-year. Then the classic recrimination began and the aero department rather was hollowed out. Strategic calls too became almost risible, and indeed no fewer than three early-year victories were lost at least in part to aggressive shouts that were unnecessary and backfired (word is that the desire to be always aggressive came direct from Marchionne). But even so the SF16-H never was up to the job. It had a few vices - being tricky to set up and handle the tyres especially in hot conditions - but more fundamentally it was short of the downforce and power of the Mercs, the latter particularly in qualifying when it never seemed able to crank the unit up like its German rival. Indeed, not once did a Ferrari start from the front row this year. Some said also that after early-season failures the Ferrari engine ran turned down. The Italian squad indeed lost its runners up slot to Red Bull, which was resurgent after a trying 2015 on and off the track. On raw pace there was little between Maranello and Milton Keynes but the Bulls made far better on it, displaying swagger right from its championship pomp. Red Bull also reclaimed its long-held prize of having the sport's must-have chassis (albeit still weighed down by the oddly-flat lining Renault power unit). On low speed grip the RB12 was untouchable, as evidenced by getting the only non-Merc pole of the year in Monaco - it should have won there too. Two races were won when Merc faltered; one each for certainly the sport's most exciting - and perhaps it best - driver line up. And despite the above bald stats of Merc dominance there was a sense of the Bulls creeping ever closer as this season went on, to be the most persistent irritant to Mercedes at any point of the hybrid era. And as with Merc we didn't always stop to pay tribute to the considerable achievement. 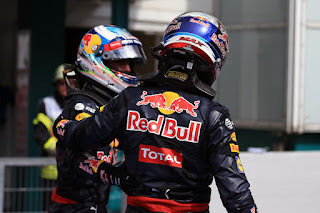 Many of us - including your author - thought Red Bull would be a modern-day Benetton. A brand getting involved in F1 primarily for marketing, being very successful very quickly but unravelling very quickly too when the success ended and key figures left. On this campaign's evidence, not so with the Bulls. Emphatically not. It remains a remarkable organisation, and with the new rules for next year (more of that anon) Red Bull is many people's favourite for the titles in 2017. McLaren Honda this season certainly improved vastly from its basement floor scraping level of 2015, albeit only to the point of being respectable midfielders. Its Peter Prodromou led chassis has never been the problem so much as the Honda power unit, which certainly progressed, being much more reliable than last campaign and Jenson Button indeed reckoned by mid-year that it had the best energy recovery deployment on the grid. That the unit was by common consent outperforming the 2015 Ferrari in the back of the Toro Rosso demonstrated the progress too. All look forward with optimism and, as Hughes outlined, there are reasons to think Honda will make a similar gain next year, as it has some easy wins from incorporating features used by its rivals. The Japanese concern will also presumably be happiest that engine development restrictions are now lifted. Renault is even earlier on that journey, with its early 2016 takeover being confirmed late meaning the car from the previously cash-strapped husk squad was rather a lemon. Mid-year even so there were conspicuous doubts about the French manufacturer's commitment. Still, there was thought to be enough potential for various mid-ranking drivers to consider Enstone a prize seat. 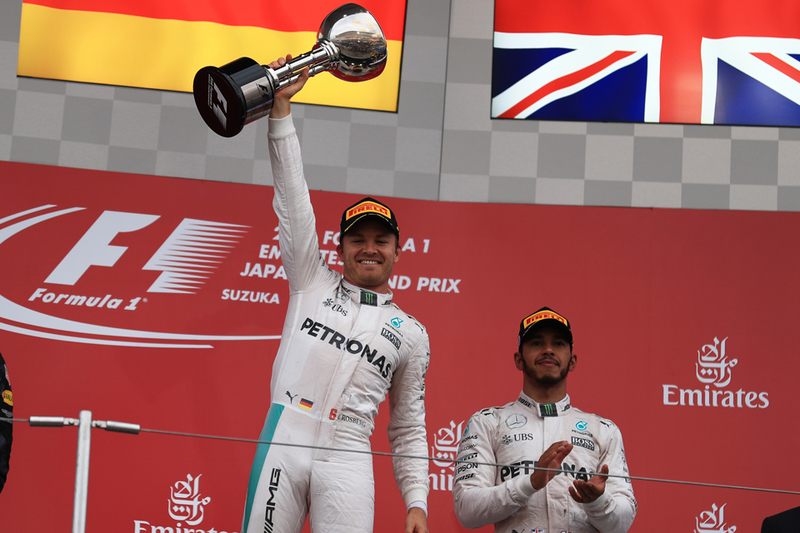 It was to Merc's relief that the few other squads that reached their potential in 2016 were too far behind to be a threat. Force India did so most notably, once again defying the annual 'surely Force India's reached its glass ceiling' claims by claiming a best ever fourth in the constructors' table. Granted it has benefited from others underperforming (some of whom we've mentioned) as well as from a class-leading Merc power unit. But it also has an effective aero programme, smart strategists, a quick and complementary driver line up and it was demonstrable apparently that this season it had the best points-per-pound-spent ratio on the entire grid. Out front though Merc once again provided some entertainment with an intra team driver battle (one can only shudder at the thought of it choosing instead to stage manage races a la Ferrari under Jean Todt...). And not only did we get an extraordinary topsy-turvey fight, not only did we even get a couple of collisions, this year the other guy won. Nico Rosberg won the first four rounds and for a time looked untouchable (no one had ever won the first three before and not claimed ultimate honours), but then an astonishing run of form got Lewis the championship lead by the summer break. But after the break Lewis for a variety of reasons floundered and Nico hit his marks emphatically with four wins from five - which all of a sudden left Lewis needing snookers. Sure enough, even four impressive wins from the remaining four for the Englishman was not enough as Nico following him home everywhere got him the title by a scant five points. And as if we needed an extra oscillation, Nico in the days after Abu Dhabi - his ultimate ambition achieved - stunned everyone by walking from the sport. A rare occurrence of big F1 news that no one knew was coming (least of all his Mercedes bosses it seems). 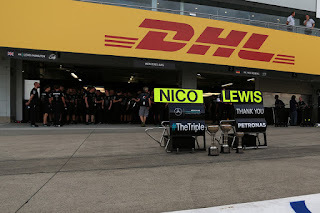 We also had an inevitable debate about who deserved it - Lewis almost certainly would have won the title with an even hand on reliability but equally brought some misfortune on himself; Nico meanwhile was hard to fault, displayed additional resolve this campaign and in F1 there's always much to be said for Getting The Job Done. Ultimately too the debate is moot, as history books will be unequivocal. Including and over and above the two Merc pilots we had it re-confirmed in 2016 that whatever else F1 is getting wrong right now driver quality is not at all among them. Daniel Ricciardo and Fernando Alonso had fine seasons, as did Carlos Sainz whose reputation was cemented this year. While the debuts of Stoffel Vandoorne (albeit briefly), Pascal Wehrlein and Esteban Ocon showed that the sport's future is in safe hands. As emphatically did Max Verstappen who confirmed what 2015 had heavily hinted at - that he's a phenomenon. And with Jenson Button and Felipe Massa (possibly) bowing out there was a distinct sense of guards being changed. It was a year for flux more generally. Which started, literally, immediately in that vein with a cringe-worthy new qualifying format. In fairness this road to hell was paved with good intentions. It wasn't even about quali as such either, rather the race which Bernie wanted to liven up by having a Saturday format that would jumble the grid more regularly. But what was come up with was in practice terrible, as for the most part there was not much to look at beyond an empty track and a clock ticking down as most chose to set their times early (Damon Hill noted dryly that the Australia pole man Lewis could have waved his own chequered flag). It didn't even achieve its raison d'etre of muddling the order. And all of the sport's strategy engineers had warned them exactly that would happen. It got worse too. Once again demonstrating that nothing succeeds like F1 dysfunction rather than ditch the thing pronto it lingered on for a second weekend - perhaps because Bernie with his usual power politics hat on didn't want to cede to a united front from the teams. Only then was it, finally, given a merciful burial. 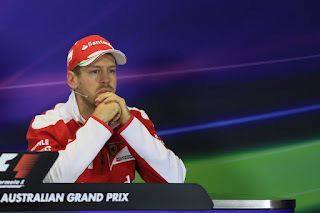 The various back-and-forth about FOM requiring three months apparently to change the quali TV graphics, but actually managing fine in days, only added to the farce. The similarly abortive radio ban was a little maligned however in my humble view. It ended badly but also had its merits in that there was a common criticism of the modern sport that drivers were being spoon fed by engineers (though as Will Buxton has noted since we could have nipped that in the bud simply by not broadcasting such messages on the world TV feed). But the ban seemed poorly, or rather unclearly or inappropriately, implemented - evidenced quintessentially by more than one mid-year case when teams felt reluctant to inform drivers of impending brake problems. On the back of one such incident with Button in Hungary the ban was scrapped wholesale. 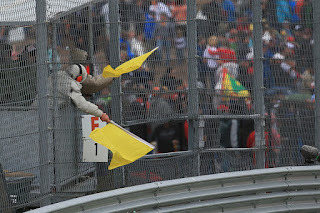 The sport's flailing and inconsistent application of track limits, wheel-to-wheel engagement as well as slowing for double waved yellow flags caused seemingly race-by-race ructions. Yet we can have sympathy with the powers-that-be also. As the sport's on-track policeman Charlie Whiting pointed out late in the year: "It's easy to suggest that decisions are made inconsistently. But no two incidents are the same...". A point that seems to elude many of those who spout the whataboutery, such as after Lewis missed the opening complex in Mexico without penalty. Next year we have flux of the more fundamental sort, with yet another sharp shift in the technical regulations. Wider tyres are way overdue and apparently the regs have created aesthetically pleasing F1 cars too. A combination of the rules and more durable Pirelli tyres will let the drivers push for longer apparently, which presumably will mean they'll have to find something else to complain about. However more aerodynamic capability is being loaded onto the cars also, and this long has been thought a red flag for the sport's decades-long bugbear of cars not being able to follow each other closely in another's wake and therefore pass each other. 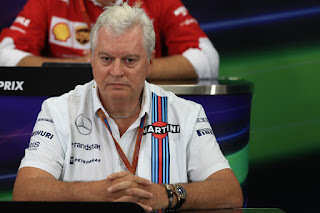 "It's a true generalisation [that more aero means less overtaking]," said Williams' Pat Symonds recently on the subject, "and the answer is no one knows [whether the new regs will aid overtaking] and that's one of the very unfortunate things about Formula One. We will move into new regulations without enough thought going into them. Sometimes it doesn't need a great deal of thought, sometimes - for example with the safety regulations - a great deal of work goes in before they're written. But many of the sporting and, shall we say, the holistic technical regulations are done, in my opinion, without enough research behind them. "The trouble is there's no mechanism for that so when you say 'ok, is a 2017 car going to be easier to overtake with?' well no one knows. It's a shame because I think with a sport like we have, a global sport, a sport that has an awful lot of cash in it, we really should be setting up something that does research these things and gives us a much more long term view, particularly this year it's been very knee jerk in a lot of regulation changes we've done." 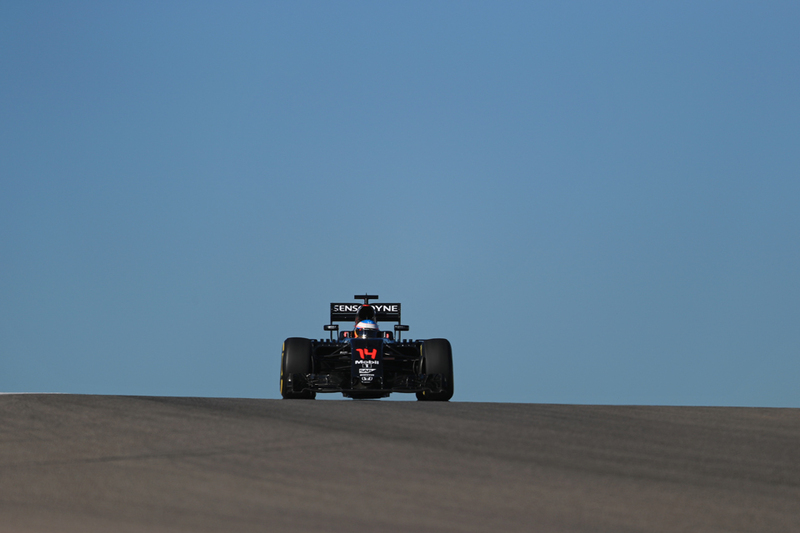 "This premise about what we wanted to do is make the cars five seconds quicker. I never understood why but nevertheless that's what was decided. If you think about that what's it really mean? Is a car that's five seconds a lap quicker more exciting? Is it more difficult to drive? You see the answer every Friday, when we go out in second practice, we're all doing the same thing, we run two sets of tyres we run first on quite low fuel then we fill the cars up with fuel to look at race performance. The difference in lap times is about four seconds, there are some circuits where I think this year we've actually lapped around five seconds quicker than we did a couple of years ago and does anyone really notice it? "It's not the lap time per se, if you want Formula One to be the pinnacle of motor sport there is an argument that on any given circuit a Formula One car ought to be the fastest lap time that can be achieved at a circuit. But that's only a perception thing, it's not necessarily spectacle. What's more spectacular round Silverstone? British Touring Cars or a Formula One car? I'm sure there be many people that would not go with my branch of the sport." It rather sums up F1's major problem right now, that almost never is there a sense of thinking and resolving exactly what it wants to be - in so doing accepting that balancing competing considerations will be necessary. Instead the sport is constantly reacting, and demanding the opposite of whatever it's doing at that moment. Emphasising this, this latest formula coming in for next year was decided but 18 months after likely the sport's most radical shift ever. And Lewis was sage 12 months ago when he noted that the new rules "just shows for me that they don't really know what they're trying to solve." Nevertheless it was a quieter year politically. The cost and supply of engines that so preoccupied us in 2015 ended suddenly and against expectation, as FIA president Jean Todt and FOM CEO Bernie Ecclestone managed to work together and break the manufacturers' grip on the sport and those teams it supplied by imposing a more equitable settlement until 2020. And it has held for now; Ferrari at least has gone quiet on the subject, "a welcome by-product, many believe, of its dismal on-track performance," reckoned Dieter Rencken. Presumably though all will take up again on the engine matter in the same 2020. Indeed some have started early, debating whether F1 should continue to seek to improve the breed by shadowing the road car industry (which probably is heading in the direction more electric - see manufacturers' recent beeline to Formula E) or cut ties and go its own way. Either path has its risks. But the sport's biggest off track shift yet awaited, and took most of us by surprise. Liberty Media's acquisition of the sport's commercial rights was aired in September. 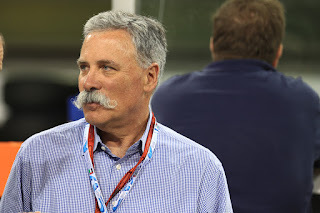 Matters certainly moved quickly, Rencken noted that while "a deal had long been mooted", Liberty Media was "just one of several potential suitors" and "the speed with which it all came together surprised even insiders." And Liberty's intentions excited too - providing the sport with long overdue investment, marketing and growth in digital and online coverage. Perhaps too there would be focus on organic growth and developing the fan experience in traditional markets, rather than the notorious CVC/Bernie approach of taking a quick buck from inflated hosting fees - often from far-flung territories caring little for growing F1. Matters threatened to accelerate too - the quintessential 'source close to Bernie' Eddie Jordan suggested as soon as the next race gathering, in Monza, that Bernie would not even last as long as the next one. Whispers then had it that he might be around only until the year's end. In the event he's hanging on indefinitely. Hot rumours that he'd be replaced with some kind of combination of Ross Brawn and Zak Brown suddenly have gone decidedly tepid. Brown underlined as much by taking a senior role at McLaren, reportedly on the grounds that being the next-but-one after Bernie was more sensible. Brawn apparently is playing a waiting game. Liberty's second stage of its purchase of stock needs to take place by the end of June 2017 to gain full control. But we should have known that nothing with Bernie involved would be that straightforward. 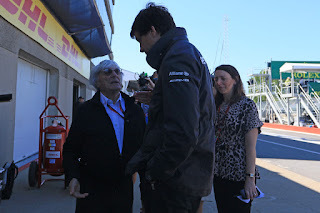 "Already there are rumours of massive disputes between [Liberty's new F1 chairman Chase] Carey and Ecclestone," added Rencken. "Folk wonder whether this is Ecclestone's last throw of the dice". And F1 still hasn't made the mental or organisational shift to any sort of post Bernie landscape. "Bernie's still Bernie and they're frightened [of] 'what will they do without him? ', as he solves problems" said Joe Saward to this end in Canada. Certainly no one in this game has got rich by writing Bernie off prematurely. This, in more than one sense, feels like it still has a way to run.